Paris is a magical city where you’ll come across some colorful and unforgettable characters. 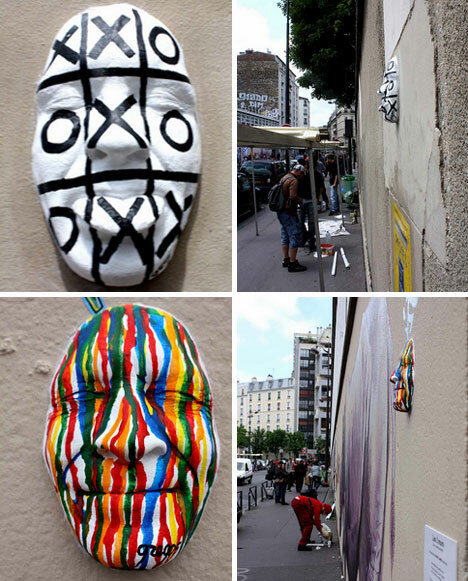 But perhaps the most colorful character of all is Gregos, an artist who has decided to make his face one of the most recognizable in Paris and elsewhere in France. 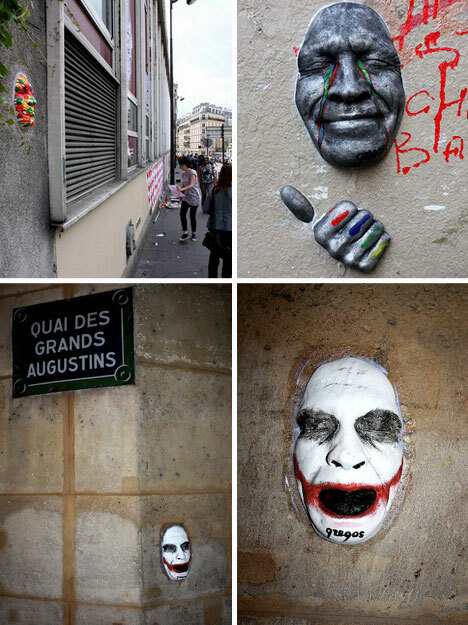 He installs castings of his own face – basically painted plaster masks – on the walls of buildings, on mailboxes, and just about every available vertical surface in Paris. 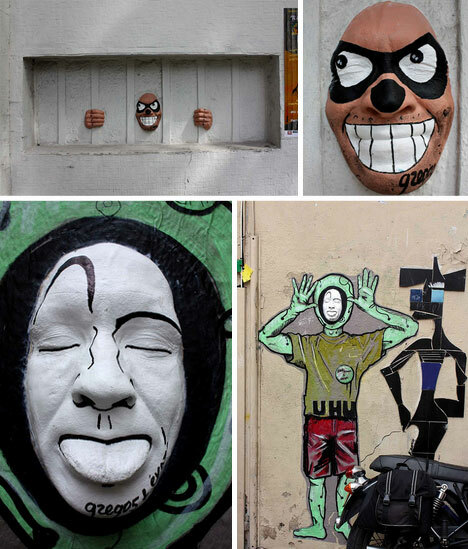 Tourists in Paris may have noticed the unusual but eye-catching faces staring at them from the walls all around the city. Gregos began his strange quest to plaster Paris with his likeness in 2006. 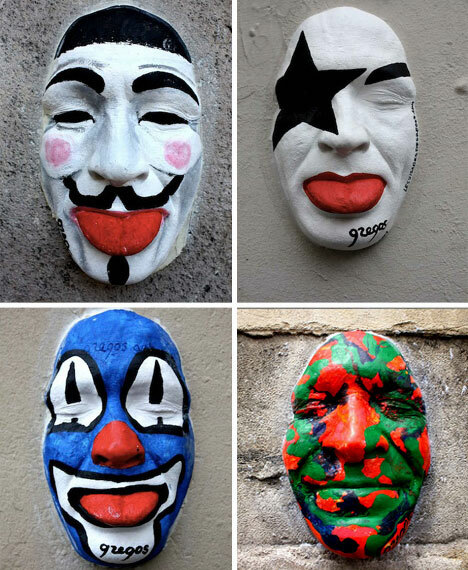 At first, the masks were blank and unpainted, featuring only a stuck-out tongue as their message to passers-by. But in the beginning of 2009, the artist decided to make his faces more visible by adding bright colors and painted designs. There are mime faces, Kiss faces, clown faces, and a number of faces that interact playfully with their locations. 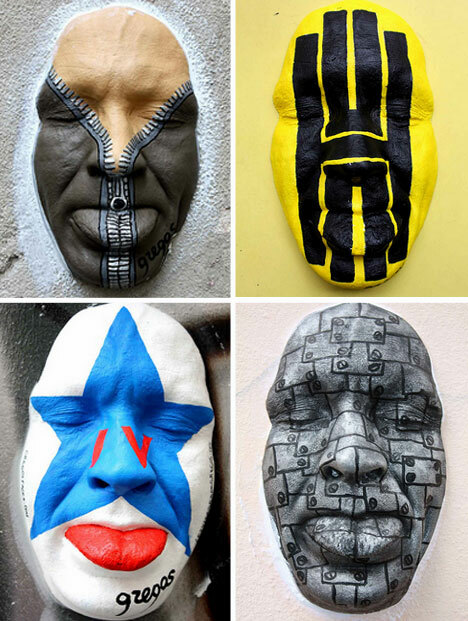 Overall, Gregos has installed nearly 170 faces in the streets of Paris, Lyon, Lille, and Malta Island. He places them in tourist areas to let plenty of people see them for free. The interaction that occurs between viewers and the masks is fascinating. Some people are put off by the faces floating out from walls, but most are amused. It seems that the majority of passers-by are delighted to find one of Gregos’ masks, as evidenced by the huge amount of photographs tourists take with the faces. People pose with the masks, make silly faces back at the plaster likenesses, and carefully photograph the visages with their surroundings. Gregos’ fun and strange art project has created a wonderfully weird kind of scavenger hunt in the streets of the City of Lights. Tourists who know about the art project are on the lookout for the masks wherever they go, and it must provide a great feeling of accomplishment to capture several of them in photographs during a trip to this stunning city.